6. Aboriginal art on canvas and board only began 40 years ago: Traditionally, the paintings we now see on canvas, were scratched or drawn on rock walls, used in body paint or on ceremonial articles and importantly, drawn in sand or dirt accompanied by the song or story. In 1971, Geoffrey Bardon a school teacher working with Aboriginal children in Papunya, noticed the Aboriginal men, while telling stories to others, were drawing symbols in the sand. 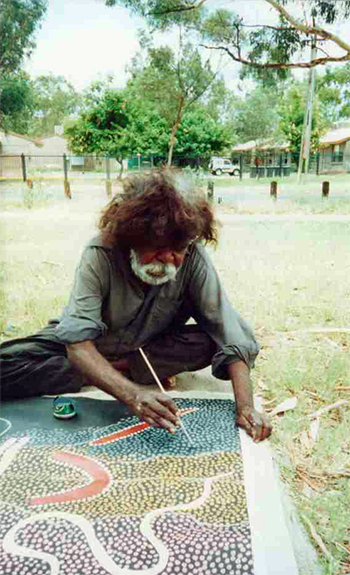 He encouraged them to put these stories down on board and canvas, and there began the Aboriginal art movement. Since then, Australian Aboriginal Art has been tagged the most exciting contemporary art form of the 20th Century. 7. Dots were used to hide secret information: Dot painting in the main, began when the Aboriginal people became concerned that white man would be able to see and understand their sacred and private knowledge. The dots (sometimes called 'over-dotting') were used to obscure the secret iconography (symbols) underneath. This has morphed into the classical style, typified by artworks from the Pintupi tribe. 8. Aboriginal artworks belong in both galleries and museums. Indigenous Australian culture is the longest surviving culture the world has seen; it is complex and centred on long term survival in a hostile environment. It is rich in spiritual teachings, knowledge, and cultural behaviour, as well as the practical skills and knowledge required to survive. Therefore, Aboriginal Art has both artistic and anthropological merit. Works painted even in recent times can qualify equally for a place in a modern art gallery or a museum. This is one of the reasons it is so special and important. 9. The highest priced Aboriginal Artworks so far were painted by Clifford Possum Tjapaltjarri for the work 'Warlugulong' which sold in 2007 to the National Gallery of Australia (NGA) for a tidy sum of $2.4 million dollars. The record for an indigenous artwork painted by a woman (and the record for any female Australian artist), was achieved by Emily Kame Kngwarreye's work 'Earth's Creation' also sold in 2007 to a private buyer for $1.056 million. 10. 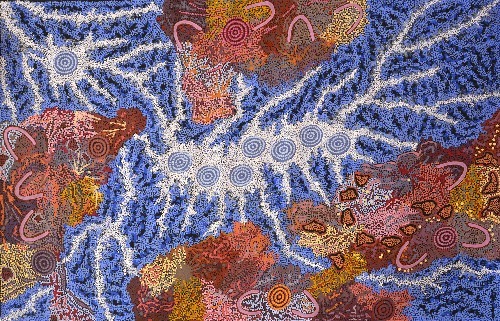 Aboriginal art has fostered cultural revival in an extremely good way for the Indigenous people. As the older artists teach the young, it has revitalised young Indigenous people's appreciation and knowledge of their culture. There have also been a number of intangible benefits, such as increasing self esteem and pride in ones culture. On the other side of the coin, non-Aboriginal people get to marvel at the beauty of Aboriginal art and begin to build stronger bridges of understanding.